In this review, we will take an in-depth look at the popular Powerblock Elite Dumbbell set. 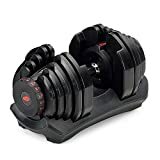 Powerblock Elite dumbbells are great for slowly increasing your muscle mass at a steady and comfortable pace. 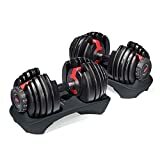 We will take a look at what these dumbbells do, how they work, what features they have, their specifications, and what real-life users are saying about them. We hope that this review will help you decide whether or not this product will work well for you. Powerblock has been putting out impressive strength training equipment since 1991. The Powerblock Elite dumbbell series integrates superior material quality with utility and full-range adjustability. These dumbbells can be used by individuals at many different fitness levels. They allow users to easily change out weights for a versatile and comfortable workout experience. 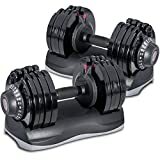 With 25 years of development in their making, these dumbbells are one of the highest-rated dumbbell options on the market today. They are designed to simplify your workout experience and made in the USA. All in all, this dumbbell choice is compact, easy to use, and very durable. There are many different ways that these dumbbells can be used. For strength training, we recommend a routine that integrates the adjustable design and many different weight plates. First of all, you should know these dumbbells have 16 different weight settings: 2.5, 5, 7.5, 10,15, 17.5, 20, 25, 27.5, 30, 35, 37.5, 40, 45, 47.5, and 50 lbs. Doing 3 sets of 10 repetitions in many different styles is a good starting point. For a full-body workout, start with a combination of floor presses, weighted sit-ups, dumbbell rows, overhead presses, and Romanian deadlifts. Pick 3 exercises to do every day with a rest day after every 3rd day of working out. Every week, slowly increase the weight limits of the dumbbells by 2.5 lbs or as you see fit. This is a great way to build muscle without tearing or straining anything. 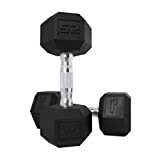 If you reach the full weight limit by working your way up to 50 lbs, remember that these dumbbells can be fitted with even heavier weight plates later on. Product dimensions and specs are important. Below, we’ve included the exact details of this product. Let’s take a look at some additional helpful information about these dumbbells. These dumbbells come with a limited warranty from most sellers. Check the product details listed by the seller you choose; some sellers include separate warranty options. Knowing what the advantages and disadvantages of a product are is important. Below, we have included some helpful information about what some of the benefits and drawbacks of these dumbbells may be. Compact – These dumbbells are compact and very easy to store. Easy to use – A simple design makes these dumbbells easy to operate and use. Durable – Steel construction means that they last a long time, are corrosion resistant, and won’t rust. 25-year design – These dumbbells are 25 years in the making! 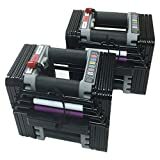 Powerblock has been continuously adjusting and making their products better every year. Olympic size – This bench accepts Olympic sized barbells as well as Olympic sized plates. Fully adjustable – Easy to use and adjust, adding weights is simple with the Powerblock Elite series. 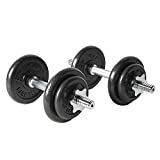 Great for many users – Whether you’re advanced or intermediate, these dumbbells are a good choice. Expandable – If you reach the 50 lb weight limit, you can expand these dumbbells to allow heavier plates. 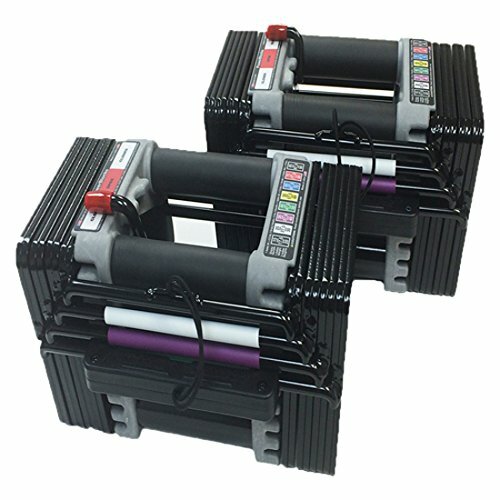 A 50 lbs upper limit – These dumbbells can only be used for up to 50 pounds the way that they are sold. Extra weights are sold separately – Though they expand for extra weight additions, you must purchase the additional plates separately. Users have been reviewing this product in real-life. Most reviews on this item are very positive. Below, we have summarized some helpful reviews from real life Powerblock customers. So there you have it! This is just about everything there is to know about the Powerblock Elite dumbbells. Hopefully, this review has been informative and helpful. We want to know how these dumbbells have worked for you; please feel free to leave us your feedback!